Described by MTV as 'The Hunger Games meets The Road', Anarchy is set in a dystopian future where rival factions have taken over, fighting each other for survival. DeVos's novels already have had over 30 million readers worldwide on Wattpad and there is a film deal in the works. All four e-books of the series will be available in the UK from June with the paperback of Anarchy publishing in August. Rights were pre-empted in Italy (Mondadori), France (Lattes) and Russia (Atticus-Azbooka) and sold in Portugal (ASA) and Serbia (Vulkan). DeVos said: "I couldn't be more thrilled that my books are going global and can reach more readers than ever. It's a dream come true to know my work will be published in so many wonderful places around the world." 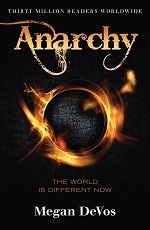 Simona Casonato, editor at Mondadori, which will publish the book in Italy, said: "Anarchy is something really fresh, fun, unconventional and original. The reason why I would love to publish Megan's books is that I would like to give to my readers something new, something they have never read before." Carmen Serrano, editor at ASA, which will publish the book in Portugal, said: "I'm so glad we made this deal! It is so refreshing to be able to publish a voice from the younger generation. Megan DeVos shows us an incredibly vivid (and scary) new world as she has us rooting for her characters. What an accomplishment!"